Past research on Madagascar indicates that village communities were established about AD 500 by people of both Indonesian and East African heritage. Evidence of earlier visits is scattered and contentious. Recent archaeological excavations in northern Madagascar provide evidence of occupational sites with microlithic stone technologies related to foraging for forest and coastal resources. A forager occupation of one site dates to earlier than 2000 B.C., doubling the length of Madagascar’s known occupational history, and thus the time during which people exploited Madagascar’s environments. We detail stratigraphy, chronology, and artifacts from two rock shelters. 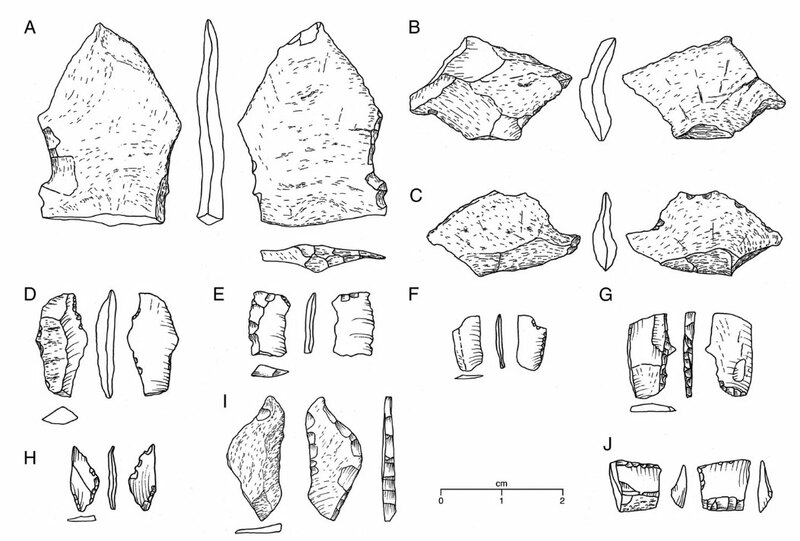 Ambohiposa near Iharana (Vohémar) on the northeast coast, yielded a stratified assemblage with small flakes, microblades, and retouched crescentic and trapezoidal tools, probably projectile elements, made on cherts and obsidian, some brought more that 200 km. 14C dates are contemporary with the earliest villages. No food remains are preserved. Lakaton’i Anja near Antsiranana in the north yielded several stratified assemblages. The latest assemblage is well dated to A.D. 1050–1350, by 14C and optically stimulated luminescence dating and pottery imported from the Near East and China. Below is a series of stratified assemblages similar to Ambohiposa. 14C and optically stimulated luminescence dates indicate occupation from at least 2000 B.C. Faunal remains indicate a foraging pattern. Our evidence shows that foragers with a microlithic technology were active in Madagascar long before the arrival of farmers and herders and before many Late Holocene faunal extinctions. The differing effects of historically distinct economies must be identified and understood to reconstruct Holocene histories of human environmental impact.